The Syrian Arab Army have achieved yet another dramatic victory this time lifting the ISIS siege of the heroic city of Deir Ezzor. For years Deir Ezzor has been surrounded by enemies and under siege first by the FSA and Al Nusra and then by ISIS. They have withstood repeated attacks by the US-NATO air force most infamously last fall when the Americans bombed Deir Ezzor right after agreeing to a ceasefire, a treacherous move that paved the way for a nearly successful ISIS offensive to capture the city. The brave defenders of Deir Ezzor withstood these endless attacks becoming a symbol of the heroic resistance of all of Syria. For years Syrians and their friends around the world have dreamed that one day this siege would be lifted. Our dreams have finally come true and faster then anyone could have imagined. The liberation of Deir Ezzor from ISIS siege is the culmination of months of dramatic SAA victories against ISIS. Now we dream that a final victory may be near in Syria. Once again the SAA and their allies Hezbollah, Russia, and Iran have stunned the world. The empire of Chaos is in a panic. Netanyahu of Israel is hysterical with rage attempting to spoil the victory in Deir Ezzor with yet another of it’s illegal and cowardly air strikes on Syria. The whole strategic balance of the world is changing before our eyes. And it is all due to the enormous courage of the Syrian people who have withstood this dirty war launched by seemingly half the world on their country. Syria has resisted the US, Israel, the British, the Saudis, Qatar, Turkey, UAE, Kuwait, France, Germany, and the rest of the GCC/NATO lackeys that make up the the Axis of Chaos. They have resisted armies of fanatical, brutal, killers recruited across the middle east, Africa, Europe, and Central Asia. They have defeated a CIA trained horde of torturers, rapists, slavers, cannibals, and of course killers. Has any country in history battled against the odds Syria has faced? Is the victory in Deir Ezzor the most glorious in human history? Only a few short months ago it was unclear whether Deir Ezzor would survive long enough for the SAA to lift the siege. ISIS launched offensive after offensive and with the help of the earlier US air strikes ISIS even managed to cut the city in half last January. Then even more desperate offensives followed and ISIS made some dangerous strategic gains. ISIS always began every offensive with their trademark suicide truck bomb attacks. However the SAA managed to crush these ISIS offensives turning the town into the graveyard of ISIS. The SAA were under the command of the legendary Major General Issam Zahreddine who has lead the defense of the city since July of 2014. Every day for over 1000 days the SAA, Hezbollah and the local national defense forces were on the front lines defending the cities’ 100,000 residents from ISIS. The civilians were equally heroic in withstanding years of siege especially the defiant women of Deir Ezzor who braved kidnappers, snipers and rocket attacks to find food for their families. Their husbands were often dead or fighting on the front lines and it was the stubborn bravery of the women of Deir Ezzor that allowed the city to survive the siege. The people of Deir Ezzor withstood untold suffering their electricity was cut off, food was scarce, medicine hard to find. Thanks to the treacherous attack of the US air force ISIS was able to seize the towns clean water supply and the town was forced to drink polluted river water to survive. Rockets, artillery, mortars and sniper fire terrorized them like so many Syrians who have survived these terrorist sieges. They lived in constant fear that ISIS might capture the city. Despite all this they remained defiant determined to resist to the end. I’ll never forget the sight of hundreds of Syrian mothers, and grandmothers armed with Ak-47s and warning ISIS they would fight to the death to defend their families. Thankfully due to bravery of the SAA and their allies it never came to that and against all the odds the city resisted every attempt to capture it. In the end they were defending the city with only 2 tanks and artillery that were long past their life expectancy after being fired so many times without replacement. The victory at Deir Ezzor is the culmination of months of SAA offensives that have liberated thousands of square kilometers in the past few months. To the North expanding on the victory in Aleppo the SAA steadily advanced east towards and then past Raqqa. To the south of them was a huge swath of Syrian territory occupied by ISIS separating them from the SAA territory extending into Palmyra. In a stunning series of victories the SAA managed to cut this ISIS pocket off from it’s supply lines divide it in two and completely encircle them liberating a huge amount of territory and opening the way for the final push towards Deir Ezzor. Those who followed the amazing victories of the NAF during the war in Ukraine could not help but recognize the brilliant behind the scenes role Russian Spetsnaz advisers played in the recent SAA victories. ISIS is still desperately resisting it’s inevitable defeat but it is clear that the SAA, Hezbollah and Russia have dealt it a decisive defeat in Syria. These victories owed much to Syria’s elite Tiger Forces who also played a decisive role in both the victory in Aleppo and the end of the siege of Deir Ezzor. 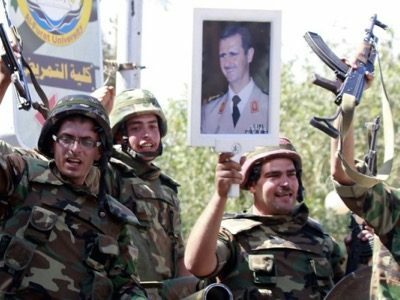 In a war where battles have raged for weeks over a tiny village or even a single building the SAA have managed to liberate thousands of miles in recent weeks. Once again the SAA have accomplished the impossible. It is no wonder Syria’s enemies are acting even crazier then usual. The US has sent it’s SDF Kurdish mercenaries to try to block further SAA advances. The Kurds would be wise to break out of their servitude to the empire soon before the Americans provoke some terrifying disaster. At the same time the US is trying to embroil the Kurds with a war with the SAA rumor has it the US has already made plans to abandon them to their fate. In the week before the siege on Deir Ezzor was broken the US sent it’s helicopters in to evacuate certain key ISIS commanders exposing yet again that ISIS is merely a tool of the CIA and it’s allied intelligence agencies. In revenge Russia bombed ISIS with a thermobaric bomb and has been showing off it’s cruise missiles in devastating attacks on ISIS which are also a warning to the US and it’s SDF pawns. The US responded to the liberation of Deir Ezzor by bombing a nearby refugee camp killing Syrian children in a criminal and cowardly attack. The US is also in an ever intensifying panic over Russia although it seemed impossible for the anti-Russian Hysteria to grow even crazier. They are locked in a diplomatic war with Russia expelling each others diplomats and installing more harsh sanctions on Russia, Iran, North Korea and Venezuela. They are targeting RT and Sputnik. It has gotten so out of control that USA Today foolishly attacked my blog for exposing the fascist coup in Ukraine. It was part of the latest Russian propaganda Hysteria backed by the CIA/BND Front the German Marshall Fund and it’s Alliance for Securing Democracy’s Hamilton 68 Project which spies on 600 pro-Russian twitter accounts or as they call them “Kremlin controlled bots and trolls.” Basically anyone who opposes fascist Ukraine or the schemes to have Al Qaeda and ISIS destroy Syria is now being labeled a Russian propagandist regardless of whether they are Americans, Canadians or western europeans and are accused of destroying democracy by informing the public. This arrogant NATO think tank believes the only way “to secure democracy” is to destroy free speech. Luckily they are far too late to prevent the world from realizing the criminal nature of American Foreign Policy which brings destruction, misery, poverty, and war to the entire planet. Syria’s other enemies are also in a panic. Netanyahu of Israel made himself into a global laughingstock when he traveled to Russia to beg Putin to stop the SAA advances which he insanely believed was Iranian expansionism. Putin told him Iran was a Russian ally and they say Netanyahu flew into a rage and threatened to bomb Assad’s presidential palace. He had to content himself with yet another illegal Israeli bombing. Still Israel remains dangerous and unpredictable and is in a panic over the fact that Hezbollah has only grown stronger during the war on Syria. Hezbollah achieved a major victory in the Qalamoun mountains finally cleaning out a nest of ISIS terrorists who were forced to evacuate in busses to their ever shrinking territory in Eastern Syria. The Saudis are feuding with the Qataris while they continue their US-UK-NATO backed genocidal war on Yemen. Meanwhile the whole world is wondering wether mad emperor Trump will embroil the world in a nuclear war over North Korea. I predict that the whole thing is just an embarrassing bluff another humiliation for the Empire of Chaos. Still the US is on the attack everywhere in the world. It’s latest coup plot in Venezuela has met a humiliating defeat the fascist opposition discredited themselves with their reign of terror and Venezuela has voted to further advance the Bolivarian Socialist Revolution. Meanwhile in Syria they are celebrating and rebuilding, Syrian’s forced to flee as refugees are now returning home now that the NATO death squads have been driven out of so much of the country. Where two years ago there was a gloomy determination now Syrians are again dreaming of the bright future ahead when they have rebuilt their country. The liberation of Deir Ezzor was celebrated across Syria especially in Deir Ezzor itself. Now that the SAA have broken the siege food and medical supplies can finally enter the town and children can now go to school without fear of being shot by snipers. Everywhere in Syria people are dreaming of a final victory and the return of peace. Unfortunately the war is far from over but Syria has become an inspiration to the world a symbol of heroism and resistance. In the face of all the Axis of Chaos could throw at them the armies of terrorists, NATO bombers, the US marines, the CIA plots, the billions in weapons, the sanctions and the propaganda war Syria refused to surrender. A lesson to everyone resisting the empire of chaos remember Syria and never stop fighting.